Ostensibly, The Control Room by Jehane Noujaim, is a documentary about the inner workings of the Arab-run satellite news network, al-Jazeera. The control room of the title looks a bit like the bridge of the Starship Enterprise and is also like it in being a small community of well-meaning, like-minded people, peering out at the world through its banks of monitors as if it were another planet. And, so far as most Americans are concerned it might as well be another planet. 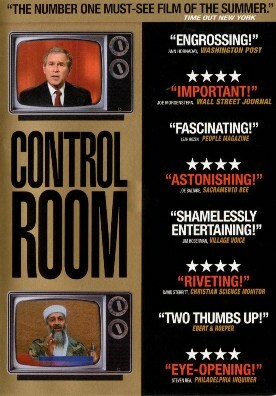 For the point of the film is not really to tell us the story of al-Jazeera. It is to convey in a readily comprehensible and sympathetic form — that is to say, by introducing us to a group of educated, middle-class, tech-savvy people who look like us and talk like us and do the same kinds of jobs that we do — the Arab view of America’s war in Iraq. Or is it just an Arab view? Are there lots of other Arabs who do not appear on camera and who, as Vice-President Cheney famously predicted, welcomed American troops as liberators? If so, you wouldn’t know it from this film. The al-Jazeera journalists even assume that the people in the famous shots of the toppling of Saddam Hussein’s statue were American stooges. The problem is that the film’s main characters are just a little too familiar, a little too much like us — or at least like those of us who belong to or are on friendly terms with the journalistic élite. A particularly revealing moment in the film comes when one of Noujaim’s favorite al-Jazeera journalists, Hassan Ibrahim, meets a former colleague from the BBC. "What are you doing now?" asks the BBC man. "Working for al-Jazeera," says Ibrahim. "Because everybody that works for the BBC eventually works for al-Jazeera." The war’s supporters might find themselves muttering in reply that everybody that works for the BBC might as well be already working for al-Jazeera, since their take on the war was so similar. But the real point is that journalists of every nationality tend to travel in packs and to adopt the pack mentality. Really, instead of giving us "the Arab view" of the war, the film gives us an Arabic variant of the journalistic view of it. True, this view was not always so negative at the time, mainly because of the success of the "embedding" program. But it has become overwhelmingly negative since, which just makes the al-Jazeerites look a bit more advanced — like the communists of the 1930s who were said to be "liberals in a hurry." Above all, they find it natural to take up the Western journalists’ conceit of themselves as being smarter and less credulous than thee and me, and blessed with wider and more creditable sympathies than those of us who are merely patriotic. It is in this spirit that we are meant to watch Josh Rushing, the young U.S. Marine lieutenant who was one of the team of American military flacks at Doha, Qatar, making what is obviously meant to be one of the film’s major points. He tells the camera that he couldn’t help comparing the now-notorious al-Jazeera shots of dead American soldiers with the American TV networks’ photos of Iraqi bomb victims. "It made me realize how al-Jazeera must have felt," he says — though how al-Jazeera usually felt was delighted to have more material in support of their anti-American message. "I can tell what they’re showing, and what they’re not showing by choice," Lt. Rushing then continues, "and it’s the same thing when I watch Fox on the other end of the spectrum." The moral equivalence argument comes in many forms and has been much in use by the American media lately in the wake of the revelations from Abu Ghraib prison, but this is one of the subtlest. It is also designed to appeal to America’s own journalistic consensus, which holds that Fox is "biased" towards conservative and pro-American points of view. Of course in making such a charge, our boys at NBC, CBS, ABC and CNN have to pretend that they themselves are unbiased, and al-Jazeera can always have some fun by accusing them, too, of being propagandists for the American side — a charge of which they are much more afraid than the opposite one. That seems to be the point of the cheerful acknowledgement by Samir Khader, a Senior Producer with al-Jazeera, that "You can’t have a war without propaganda." — the clear implication being that his network is there to provide the Arab propaganda just as the American networks are there to provide it for the coalition side. If only they were! Although they sometimes can’t help seeing things as Americans, in the end they will nearly always re-set themselves to the default position of the journalistic consensus, which eschews patriotism on principle and is always inclined to see war as cruel, futile, pointless and run by incompetents. The really fascinating thing about The Control Room is that there are a few signs that the al-Jazeera journalists, although usually they are much more patriotic, are also beginning to be beguiled by the temptation of the intellectual and to think more like journalists than like Arabs. Samir Khader even admits that, if offered a job with Fox he would take it. He wants to send his kids to America to be educated and thinks that the way to solve the problems of the Middle East is for everybody to have an American passport. Whether or not our soldiers are having any luck with the hearts and minds of "the Arab street," our boys with the cameras and the notebooks are making inroads in the Arab newsroom.